1MSc of Midwifery, Department of Midwifery, Babol University of Medical Sciences, Babol, Iran. 2M.Sc. of Midwifery, Department of Midwifery, Mazandaran University of Medical Sciences Address: School of Nursing & Midwifery, Vesal st., Amir Mazandarani Boulevard, Sari, Iran. 3PhD of Pharmacognosy, Department of Pharmacognosy, Mazandaran University of Medical Sciences, Sari, Iran. 4MD, Obstetrician and Gynecologist, Amol Hospital, Amol, Iran. 5BSc of Laboratory Sciences, Faculty of Nursing & Midwifery, Mazandaran University of Medical Sciences, Sari, Iran. M.Sc. of Midwifery, Department of Midwifery, Mazandaran University of Medical Sciences Address: School of Nursing & Midwifery, Vesal st., Amir Mazandarani Boulevard, Sari, Iran. Nikpour M, Shirvani MA, Azadbakht M, Zanjani R, Mousavi E. The Effect of Honey Gel on Abdominal Wound Healing in Cesarean Section: A Triple Blind Randomized Clinical Trial. Oman Med J 2014 May; 29(4):255-259. Objective: To assess whether honey can accelerate the wound healing in women undergoing cesarean section. Methods: This was a triple blinded randomized prospective clinical trial. Women with cesarean section were randomly designated as drug (37 cases) and placebo (38 cases) groups. The drug group received local honey gel 25% while the placebo group received similar free-honey gel on abdominal cesarean incision twice a day for 14 days. REEDA scale (Redness, Edema, Ecchymosis, Discharge and Approximation of wound edges) was used to assess wound healing. Results: The mean REEDA was 2.27 ± 2.46 and 3.91 ± 2.74 (p=0.008) on the 7th day and 0.47 ± 0.84 and 1.59± 1.95 (p=0.002) on the 14th day for the drug and placebo groups, respectively. Redness, edema and hematoma in the drug group were significantly lower on the 7th and 14th days. 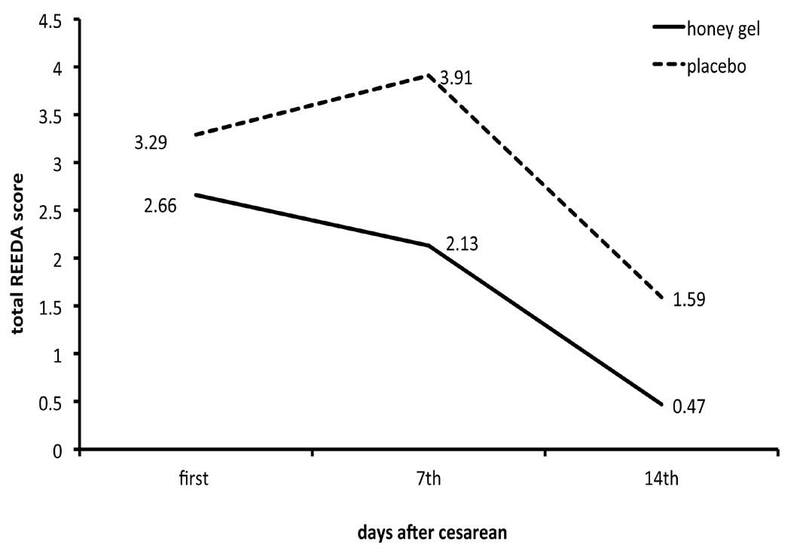 Conclusion: Honey was effective in healing the cesarean section incision. Using topical honey is suggested as a natural product with rare side effects in order to reduce the complications of cesarean wounds. Keywords: Cesarean, Healing, Honey, Incision, Wound. Nowadays, cesarean is one of the most common surgical interventions and its prevalence has increased in most countries in the recent years.1-5 Wound complications are of the most common morbidities following cesarean section.6 The prevalence of wound infection and disruption after cesarean has been reported as 3-15%, averagely speaking 6% and 2-42% in various studies.7,8 These complications affect mother`s quality of life due to stress, anxiety, delay in mother`s ability and health recovery,9 and also they are associated with additional cost as a result of the increased need for wide spectrum antibiotics and sometimes hospitalization and repeated repair of wound. Local treatments are not commonly used for wound healing in cesarean and mostly oral antibiotics are prescribed for infection prevention.10 Today, the increase in bacterial resistance to antibiotics and heavy costs of medical care has led to more attention to traditional treatments. Thus, it seems necessary to perform further investigations in this field because of some conflicts in the previous reports. In addition, most of the prior studies have been conducted on complicated wounds like infected or disrupted wounds, and the effects of honey on preventing these complications have not been assessed. On the other hand, based on the recent care standards, antibiotics prophylactic use isn’t recommended in uninfected wounds and there are few evidences demonstrating their effect on accelerating wound healing.25 Thus, considering the importance of the mother`s health recovery and also the limitation of taking drug during breastfeeding, this study is designed to assess the effects of honey on abdominal incision healing in cesarean surgery. This was a randomized prospective clinical trial with parallel and triple blinded design approved by the Ethical Committee of Mazandran University of Medical Sciences, conforming to the Declaration of Helsinki. The study population consisted of all women with cesarean section in a public hospital located in the north of Iran. One specific surgeon performed all the cesarean sections. Women enrolled after studying the information form and giving conscious consent; they were randomly designated as drug and placebo groups using permuted block randomization. The inclusion criteria were at least 5thgrade of primary schooleducation, 37-42 week gestational age and lower transverse abdominal incision. The exclusion criteria included smoking; the disease history disturbing wound healing like systemic chronic and immune system diseases; consumption of drugs affecting wound healing such as corticosteroids, anticoagulants, immunosuppressants, chemotherapy; obstetric problems such as preeclampsia, additional bleeding, chorioamnionitis and prolonged duration of cesarean section (over 60 minutes). Sample size was calculated based on the study results obtained by Sekhavar,26 and considering the confidence interval (z1) 95% and the study power (z2) 95%, the surgical wound improvement rates of 85% and 50% in intervention and control groups and also 10% dropout; Therefore, 44 patients were chosen for each group. Initially, the eligible women were selected in the first day after surgery by the co researcher. One pharmacist prepared both drug and placebo. The basic element of the drug was natural honey; 5 types of honey were assessed and compared for the components including carbohydrates like sucrose, fructose and glucose. Also fructose/glucose ratio, invert sugar and humidity percentage were determined and microscopic evaluation was done for pollen. The criteria to judge the quality of honey were maximum 5% sucrose, maximum 20% humidity, minimum 0.9 fructose/glucose and considerable amount of pollens.27 According to these criteria, coriander & Goat´s-thorn honey was selected. This honey was examined through culture in order to insure that there was no infection. Thus, a combination of honey (25 Gr), glycerin (5 Gr), carbopol (0.55 Gr), methyl paraben (0.18 Gr), triethanolamine (0.5 Gr), propyl paraben (0.02 Gr) and distilled water (69.3 Gr) was prepared as the gel product. For this purpose, at first carbopol was added to the deionized and autoclaved water and held for 24 h in a situation like laminar flow. Then this product was mixed (400 RPM/min) and the other materials were added to it. Meanwhile, the amount of invert sugar was checked for being standard. Based on the study by Basson, the honey with concentration of 25% was effective for most of the organisms28; therefore, the honey gel in this study was prepared so that it had 25% honey. The placebo was prepared using the same amount of the mentioned materials except for the honey with the same form and consolidation. The final products of placebo and drug were submitted to the laboratory to be examined for the organism culture and then were used in the trial. The required training for wound care, personal hygiene and nutrition were given face to face to the groups. Then in both the drug and placebo groups, the similar gel with a specific code was given to the mothers and they were trained to use it twice daily (12 ± 2 hours) for 14 days. The mothers had the chance to call the researcher for any problems or questions. The nutritional status is one of the factors affecting wound healing and its tight control is impossible, but through similar training and food meals containing milk, dairy products, meat, fruit and vegetables, efforts were made to relatively control it in the follow-up period. Wound healing status was assessed using REEDA scale which is based on the amount of redness, edema, ecchymosis, discharge and the approximation of wound edges (each one scored between 0-3); the final score was the sum of the items scores. Lower score indicated better healing. The REED scale is a valid tool for assessing wound healing confirmed by Davidson.29 Researcher`s function was supervised by an obstetrician; for ten patients, wound healing was assessed by both the researcher and the obstetrician revealing reliability (r=0.9) of the results. Data was collected from admitted women after surgery by the researcher using forms including maternal the demographics, obstetrical characteristics and postoperative events.Initially wound healing status was assessed in supine position on day 7 and 14 post surgery using REEDA scale. The patients’ satisfaction with wound healing was evaluated at the end of the second week by questioning them through a five- point Likert scale. All the cases received routine drugs post-surgery like analgesics and antibiotics. Descriptive statistics were applied to explain the cases’ characteristics. The study groups were compared by Chi-square, t-test and the repeated measurement test. The significance level was considered as 0.05. First, 88 eligible women were recruited. After excluding some women in each group due to the existence of some confounding variables, the data were completed and analyzed for 37 women in the drug group and 38 in the placebo group. Because the dropout was taken in sample calculation, the necessary sample was obtained. Table 1 shows that there is no statistically significant difference between the groups for demographic and obstetrical characteristics (p>0.050). Table 1: Comparison of demographic and obstetrics characteristics between honey gel and placebo group. Figure 1: Comparison of REEDA score between honey gel and placebo group during the study. On the first day, there were no significant differences for all REEDA items scores between the groups, but on the 7th and 14th days except for discharge and approximation of wound edges, the other items of REEDA scale were significantly different among the groups (Table2). 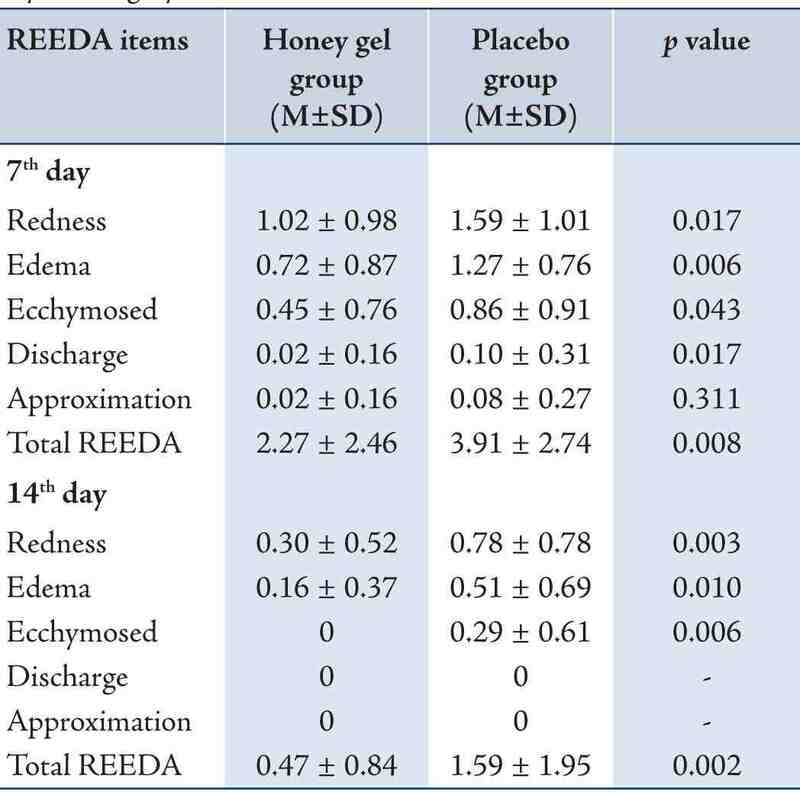 Also the total REEDA score in honey gel and placebo groups was not significantly different on the first day (2.75 ± 2.81 and 3.29 ± 2.31, respectively) while it was significantly lower in honey gel group compared with the placebo one on days 7 and 14 (table 2).The repeated measurement tests revealed a meaningful difference in wound situation by time (p<0.001) and also a significant difference between the two groups (p=0.010). Figure 1 depicts the changes of the total REEDA scores in the study groups. Table 2: Comparison of cesarean wound situation based on the REEDA scale between honey gel and placebo groupin 7th and 14th days of surgery. There were no significant differences between the honey and placebo groups for regular consumption of antibiotic (89% and 94%, respectively) and the intake of daily ferrous tablets (97% and 92% respectively). All participants in the two groups had consumed milk, meat, fruits, vegetables and cereals each day. The usual activity started in the first week in 24% and 24% of women in the honey gel and placebo groups respectively. Also 92%, and 95% of the participants in these groups, respectively, had walked less than 1 hour daily. There was no difference between the groups for activity rate. The satisfaction rate for wound healing status was significantly different between the study groups (p<0.001). The majority of the honey gel group (86%) had very high satisfaction in comparison to the placebo group (26%). Nowadays due to the increasing number of cesarean surgeries, wound complications like infection and disruption have got up.4,6,8 On the other hand, complicated wounds like infected surgical incisions resistant to routine treatment have increased.11 In addition to the heavy cost of care services, these problems have led to paying new attention to traditional therapies.21 Most of the studies have assessed infected wounds treatment, so there are rare evidences about the effect of local treatment in the wound healing acceleration after surgery.30 In this study, the effects of local honey gel on the improvement of uninfected abdominal wound in cesarean have been assessed. In this study, the rate of wound edema was significantly lower among those who used honey gel in comparison with the placebo group. Through decreasing inflammatory responses, honey leads to reducing wound edema and exudation; this process stimulates angiogenesis, granulation and epithelialization, and as a result, accelerates wound healing.21 The satisfaction rate also was higher among the women in the honey group which was expected as the reason for healing process improvement. There is no strong evidence supporting the idea that using conventional local treatments accelerates wound healing,19,25 while honey due to its viscosity and hydroscopic quality spreads in wound bed and prepares the apt condition for healing and has been mentioned useful for abdominal wounds.11 Based on this study, it seems that honey is effective in preventing infection and accelerating abdominal wound healing in cesarean surgery. Of course, the prevalence of infection is different among the communities for various factors such as hygiene level and diet, so this treatment may be more useful in high risk women. One of the strengths of this study in comparison to other studies is the presence of placebo group and being a triple blinded study. Moreover, in contrast to other studies, the effect of honey on the uninfected wounds healing has been assessed which has been less considered previously. The limitation of this study that the effects of various types of honey were not investigated, and since the type and concentration of honey are effective on the outcome, further studies are recommended to make honey standardized and to assess the effects of its dosage, duration and the repetition of treatments, the stability and potency of the medication on storage and the costs. Also another limitation was that the culture of wound bed for infection wasn’t obtained. Honey was effective in healing the cesarean section incision. Using topical honey is suggested as a natural product with rare side effects in order to reduce the complications of cesarean wounds. This study is the result of project no. 88-99 approved in the Research Deputy of Mazandaran University of Medical Sciences. The authors would like to thank this respectful deputy for support, Mr. Zain- Al-AbedinBabaei for laboratory tests and also all participants who helped us to performing this research. There is no conflict of interest. 1. Black C, Kaye JA, Jick H. Cesarean delivery in the United Kingdom: time trends in the general practice research database. Obstet Gynecol 2005 Jul;106(1):151-155. 2. Hamilton BE, Martin JA, Ventura SJ. Births: Preliminary data for 2006. Natl Vital Stat Rep 2007;56:1-18. 3. Villar J, Valladares E, Wojdyla D, Zavaleta N, Carroli G, Velazco A, et al; WHO 2005 global survey on maternal and perinatal health research group. Caesarean delivery rates and pregnancy outcomes: the 2005 WHO global survey on maternal and perinatal health in Latin America. Lancet 2006 Jun;367(9525):1819-1829. 4. Cunningham FG, Leveno KJ, Bloom SL, Hauth JC, Rouse DJ, Spong CY. Cesarean delivery and peripartum hysterectomy. Williams Obstetrics. 22th Edition. USA,2010.p.544-545. 5. 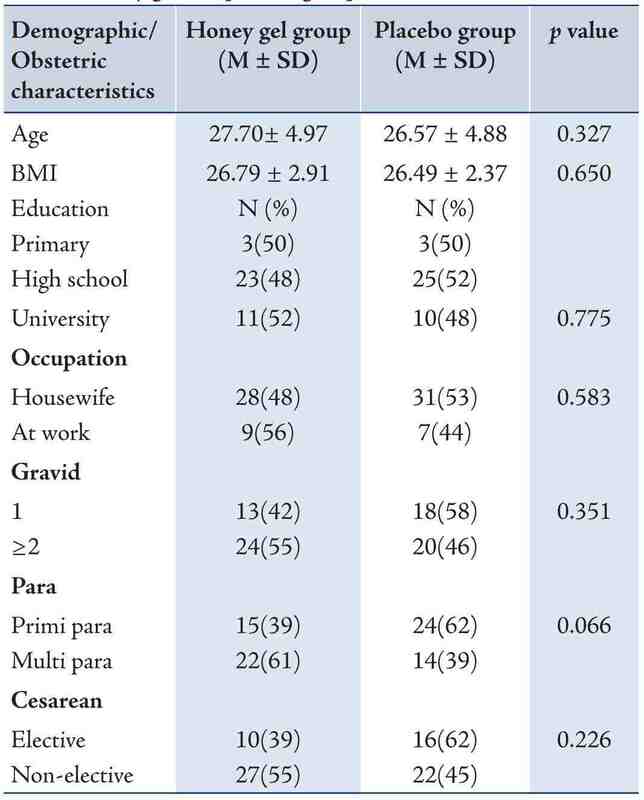 Al Busaidi I, Al-Farsi Y, Ganguly S, Gowri V. Obstetric and non-obstetric risk factors for cesarean section in oman. Oman Med J 2012 Nov;27(6):478-481. 6. Owen J, Andrews WW. Wound complications after cesarean sections. Clin Obstet Gynecol 1994 Dec;37(4):842-855. 7. Cunningham FG, Leveno KJ, Bloom SL, Hauth JC, Rouse DJ, Spong CY. Puerperal infection. Williams Obstetrics. 22th Edition. USA,2010. p.665. 8. Magann EF, Chauhan SP, Rodts-Palenik S, Bufkin L, Martin JN Jr, Morrison JC. Subcutaneous stitch closure versus subcutaneous drain to prevent wound disruption after cesarean delivery: a randomized clinical trial. Am J Obstet Gynecol 2002 Jun;186(6):1119-1123. 9. Mousavi SA, Mortazavi F, Chaman R, Khosravi A. Quality of life after cesarean and vaginal delivery. Oman Med J 2013 Jul;28(4):245-251. 10. Gunn B, Ali S, Abdo-Rabbo A, Suleiman B. An investigation into perioperative antibiotic use during lower segment cesarean sections (LSCS) in four hospitals in Oman. Oman Med J 2009 Jul;24(3):179-183. 11. Lusby PE, Coombes A, Wilkinson JM.Honey: A potent agent for wound healing? J Wound Ostomy continence Nur2002;29(6):295-300. 12. Anderson I. Honey dressings in wound care. Nurs Times 2006 May;102(22):40-42. 13. Molan PC, Betts JA. Clinical usage of honey as a wound dressing: an update. J Wound Care 2004 Oct;13(9):353-356. 14. Molan PC. Re-introducing honey in the management of wounds and ulcers - theory and practice. Ostomy Wound Manage 2002 Nov;48(11):28-40. 15. Dunford C, Cooper R, Molan P, White R. The use of honey in wound management. Nurs Stand 2000 Nov;15(11):63-68. 16. Elolemy AT, Albedah AM. Public knowledge, attitude and practice of complementary and alternative medicine in riyadh region, saudi arabia. Oman Med J 2012 Jan;27(1):20-26. 17. Namias N. Honey in the management of infections. Surg Infect (Larchmt) 2003;4(2):219-226. 18. Cutting KF. Honey and contemporary wound care: an overview. Ostomy Wound Manage 2007 Nov;53(11):49-54. 19. Jull AB, Walker N, Deshpande S. Honey as a topical treatment for wounds. Cochrane Database Syst Rev 2013;2:CD005083. www.thecochranelibrary.com/view/0/index.html. Accessed 28 Feb 2013. 20. Al-Waili NS, Saloom KY. Effects of topical honey on post-operative wound infections due to gram positive and gram negative bacteria following caesarean sections and hysterectomies. Eur J Med Res 1999 Mar;4(3):126-130. 21. Chang J, Cuellar NG. The use of honey for wound care management: a traditional remedy revisited. Home Healthc Nurse 2009 May;27(5):308-316, quiz 317-318. 22. Khan FR, Ul Abadin Z, Rauf N. Honey: nutritional and medicinal value. Int J Clin Pract 2007 Oct;61(10):1705-1707. 23. Phuapradit W, Saropala N. Topical application of honey in treatment of abdominal wound disruption. Aust N Z J Obstet Gynaecol 1992 Nov;32(4):381-384. 24. Moore OA, Smith LA, Campbell F, Seers K, McQuay HJ, Moore RA. Systematic review of the use of honey as a wound dressing. BMC Complement Altern Med 2001;1:2. www.biomedcentral.com/bmccomplementalternmed. Accessed 4 Jun 2001. electronic resource. 25. O’Meara S, Al-Kurdi D, Ologun Y, Ovington LG, Martyn-St James M, Richardson R. Antibiotics and antiseptics for venous leg ulcers. Cochrane Database Syst Rev 2013;12:CD003557. www.thecochranelibrary.com/view/0/index.html. Accessed Jan 2014. 26. Sakhavar N, Khadem N. Comparative Study of Therapeutic Effects of Honey and Povidone Iodine in Surgical Wound Healing in Rabbit.Shiraz E-Medical Journal [electronic resource] 2008; 9(4).Available at: http://semj.sums.ac.ir/vol9/oct2008/86060.pdf. Accessed Oct, 2008. 28. Basson NJ, Grobler SR. Antimicrobial activity of two South African honeys produced from indigenous Leucospermum cordifolium and Erica species on selected micro-organisms. BMC Complement Altern Med 2008;8:41-48. www.biomedcentral.com/bmccomplementalternmed/. Accessed 4 Jun 2001. electronic resource. 29. Davidson N. REEDA: evaluating postpartum healing. J Nurse Midwifery 1974;19(2):6-8. 30. Vermeulen H, Ubbink D, Goossens A, de Vos R, Legemate D. Dressings and topical agents for surgical wounds healing by secondary intention. Cochrane Database Syst Rev 2004;2(2):CD003554. www.thecochranelibrary.com/view/0/index.html. Accessed Jan 2004. electronic resource. 31. Ahmed AK, Hoekstra MJ, Hage JJ, Karim RB. Honey-medicated dressing: transformation of an ancient remedy into modern therapy. Ann Plast Surg 2003 Feb;50(2):143-147, discussion 147-148.